Date: Saturday March 28th, 2015. This morning was great. Slow and relaxing. I was hanging out with the Berlin Crüe that I am staying will at the empty flat. We went out for brunch and just sat around talking for a while. They are really cool. It made me really want to visit Berlin. Around noon I headed out for Milson's point. 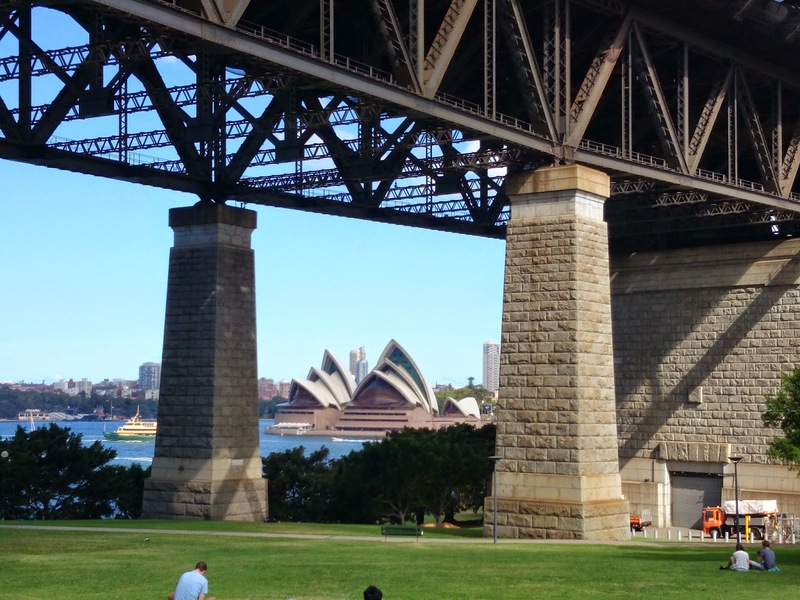 That is under the north side of the Sydney Harbor Bridge. When I arrived there were only five other people there. Slowly the group started to trickle in. Eventually we had about seventy bike messengers hanging out. The Sydney Bike Messenger Association started the Pre-Event competition there. At registration we had all been assigned a team. Bogans, Westies, or Yabbos. (The Sydney guys told us this was a bit like "redneck" or "hick".) I was on the Yabbos. We had team foot down. Then individual foot down. Next was telling jokes while doing a track stand. Teams were awarded points for jokes told while track standing. Finally was the skid contest disaster. It was all pretty fun to watch. express that enough. From the park under the bridge you could see the city and the opera house. The sun was out. The trees were green. It felt good just to be alive. After that one of the girls invited some of us over to Joe's place since it had a pool, a hot tub, and a sauna. Now that is a good way to relax at the end of a day. We did kinda screw up when leaving the pool though. Apparently when the elevator says that it only takes 14 people, 17 people is actually too many. It kinda broke after we were in it. It was stuck and wouldn't go. The elevator company had to be called to reset it. Whoops. Oh well. It was too late to whine about it. So we left for the after event party. It was at a warehouse in southwest Sydney. I spent most of the night dancing around with the Berlin Crüe.